This illustration shows a beam engine with yet another linear motion linkage. 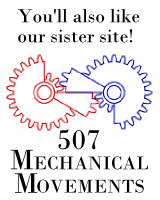 I found this linkage in FiveHundred and Seven Mechanical Movements. The book did not say who invented this linkage or what it is called. If anyone has more information, please email me!